Parables are stories about familiar things which illustrate a deeper meaning. The following parable has its roots in modern man’s search for the origin of life. In an isolated jungle of South America there lived a primitive tribe of natives. 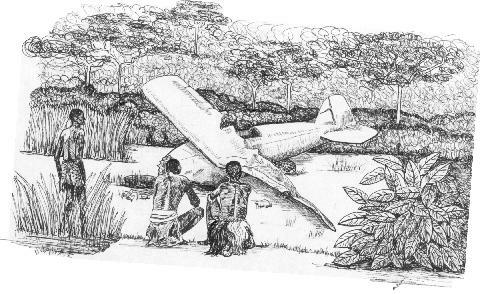 One day as a member of the tribe was hunting in unknown territory, he stumbled upon the wreckage of a crashed airplane. The debate over the origin of the strange object soon raged - where did this object come from and how did it get here? The village soon polarized into opposing view-points. One opinion was that the object was built by humans (the skeleton of one was found inside of the object) while others believed the object must have a natural origin. To believe it was created would acknowledge an intelligence surpassing their own. Those believing that the airplane was designed and built by other intelligent humans argued that this was obvious but could not prove how, why, or when. All attempts to explain how, why, or when which were not based on a belief in unguided natural processes were severely ridiculed. They soon became silent. Those believing in the natural origin of the object soon strengthened their argument by showing that the same rubber-like substance found in the tires could be found oozing from trees. Likewise the glass, paint, and fluids in the structure could be shown to occur naturally. It was agreed amongst themselves that given enough time, the structure could have built itself (although the exact mechanism was not yet known). By throwing one of the screws into the air with just the right spinning motion and catching it in just the right hole it would even partially screw into place. It was even shown that the decaying structure could be repaired and the parts rearranged. These observations confirmed (in their opinion) that they had been correct in their understanding of the origin of the object. Those who continued to believe the object was created by other intelligent humans were considered stubborn and ignorant. They were ignored, and village schools were organized so that their children would be taught only the scientific explanation. Within several generations there was no longer any dissension and the mystery seemed to be solved. And the mystery remained solved ... until the builders of the airplane returned.